WATERLOO – The “Student Move-Out Waste Program” will encourage students to recycle unwanted household furniture, clothing, electronics, food and textbooks by dropping their goods at Wilfrid Laurier University’s Northdale campus April 16, 17, 23 and 24. The new program will expand on Laurier’s residence recycling program by giving all students, including those who live off-campus, an opportunity to easily recycle their goods. The initiative will also address the issue of curbside waste during high-volume moving times in student housing areas. “This waste program will put less into the landfill, allows good items to be enjoyed by others, and will help students give back to the local community,” said Tyler Plante, coordinator: outreach and programs in Laurier’s Sustainability Office. The program is a collaborative effort with the Region of Waterloo, the City of Waterloo, Waste Management of Canada and property management groups, recycling vendors, student groups and local restaurants. 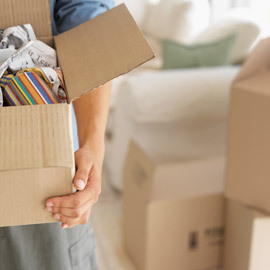 Students can drop off their furniture, clothing, decor, technology, textbooks and food to the “Move out Drop Zone” at the Northdale campus (66 Hickory St. W, Waterloo). Students who participate will receive a discount voucher for Wilf's, Fiddleheads Smoothie Bar Café, Abe Erb Restaurant or Settlement Co. Café. The items will be collected by The Food Bank of Waterloo Region, Textbooks for Change, Tech Wreckers and Goodwill Industries, Ontario Great Lakes. The only items not accepted are mattresses. The drop-off zone will run April 16, 17, 23 and 24 from noon to 6 p.m. A team of volunteers will be assisting at the drop-off zone and truck teams will be driving around identified high-volume areas to pick-up goods and encourage participation in the program. A door-to-door team will also be informing students about the program and providing a map to the drop-site. For more information about the program, contact Tyler Plante at 519-884-0710 x4192.